Civilians hurt as violent clashes spread to the west of Kachin State, displacing thousands of women, children and men. MYITKYINA, Myanmar, 9 April 2018 (UNHCR)* – Mother-of-two Ah Chang and her family were jolted out of their sleep when gunfire ruptured the night’s calm in Ting Kok Village. As bullets struck their home, they desperately sought cover while Myanmar troops and Kachin Independence Army (KIA) fighters battled outside the village last July. When dawn broke and the fighting died down, her husband cautiously ventured outside, only to be detained, along with several other men, by Myanmar soldiers who had just entered the village. Ah Chang* and her children, aged five and six, were unhurt. But when she went out, she discovered that her neighbours had been caught in the deadly crossfire. “A young boy was fatally hit, his mother was injured in the foot and her husband was bleeding from his stomach,” she said in a recent interview at a camp for internally displaced people in Myitkyina where she and her family now live. In all, five villagers were wounded and a two-year-old boy was killed during the gun battle near Ting Kok, which straddles the strategic main road between Tanai town and Myitkyina, the capital of Kachin, Myanmar’s northernmost state. After the military secured the village, the 25 local families, most of them ethnic Rawang and Lisu farmers cultivating rice paddies and orange groves, were held for some 12 hours before all – including the apprehended men – were released and taken to Myitkyina. The plight of close to 700,000 Rohingya refugees who fled to neighbouring Bangladesh following violence in the northern part of Myanmar’s Rakhine State last August has captured global headlines. 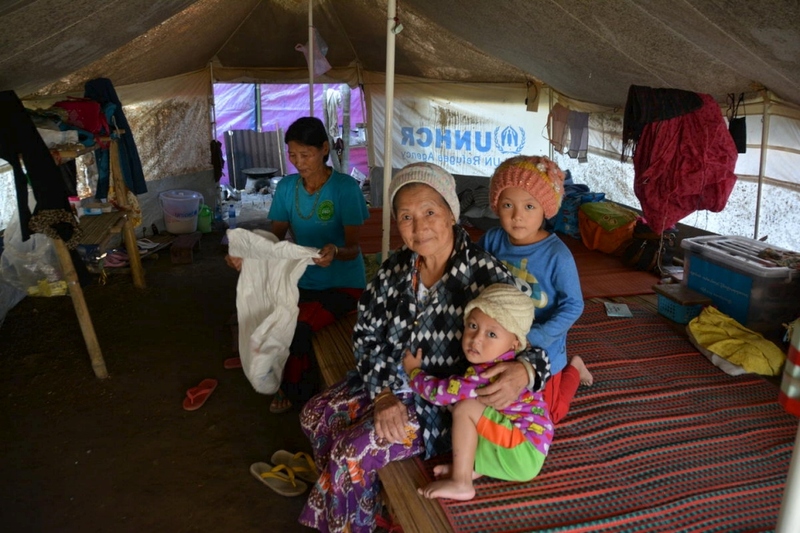 But the residents of Ting Kok are the latest to join roughly 107,000 civilians who have been internally displaced within Myanmar by conflict. They are in camps in Kachin and the adjoining northern part of Shan State, after a 17-year-old ceasefire between the military and the KIA collapsed in 2011. The ethnically diverse population of Myanmar’s northern and eastern borderlands have suffered from decades of conflict between the army and various ethnic armed groups, which demand regional political autonomy. Internal displacement has been common, while some 100,000 refugees fled to Thailand, where they have waited since the 1990s for peace and a chance to return home. An army hospital in Myitkyina treated the injured Ting Kok villagers, while a small church on the town’s outskirts has given the displaced families shelter. Set up by church leaders, Ka Bu Dam Camp is supported by UNHCR, the UN Refugee Agency. Since their arrival at the camp, the villagers have lived in emergency tents provided by UNHCR, which has also supplied cooking utensils, winter clothes, blankets, mosquito nets and other items. Additionally, they receive monthly cash transfers, food and hygiene kits from other aid organizations and Kachin State authorities. She said some villagers had since gone back to check on their homes and farms, only to find these had been looted and trashed. Fighting first spread to western Kachin’s Tanai Township last year after the military announced operations there to clear out unregulated gold- and amber-mining sites in KIA-controlled areas. Hundreds of villagers, and thousands of itinerant miners and their families were forced flee Tanai in mid-2017 and again in February this year. To the concern of UNHCR and other aid organizations, many were trapped between the warring parties for days until the military and authorities evacuated them. Such new displacement and re-displacement occurs regularly across northern Myanmar, where clashes have spread out and risen in frequency and intensity since 2016 despite an ongoing nationwide peace process. “We are urgently calling for human rights protection for civilians affected by the fighting as we are concerned about recurrent reports of people getting injured or killed by crossfire, indiscriminate shelling and landmines,” said Giuseppe De Vincentiis, UNHCR’s representative in Myanmar. “Improved aid access is also needed as fleeing families are often forced to hide for days in the forest without emergency shelter, food or medicine before they can reach safety,” he added. UN agencies and their local partners have faced a sharp reduction in access to displaced civilians in government- and KIA-controlled areas since 2016, as authorities severely curtailed travel approvals for humanitarian operations on security grounds. In Ka Bu Dam Camp, the displacement and exposure to violence has left deep mental scars among the families. “Several people here have been traumatized,” said Mana Di, a pastor at the church hosting the camp. Ah Chang’s neighbor, the 42-year-old mother whose child was killed, was seen in the camp caring for her two remaining young sons and recovering from a gunshot wound to her left ankle. She appeared reclusive and dejected, and has said she cannot recall what happened to her family during the fighting near Ting Kok. *Some names in this story have been changed for protection reasons. *SOURCE: UNHCR — The UN Refugee Agency. Go to ORIGINAL.